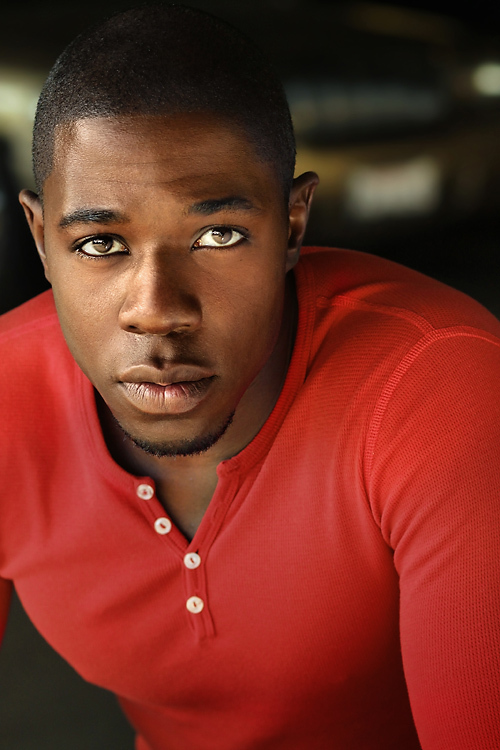 McKinley Belcher III is an actor on the rise. 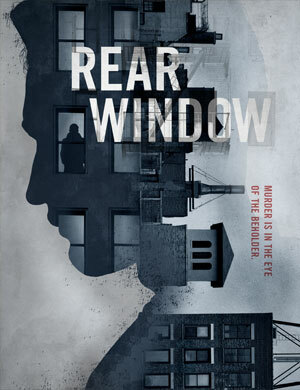 Belcher, one of the stars of the upcoming PBS Civil War drama series, Mercy Street, will now be tackling the role of Sam in the world premiere of Rear Window, adapted for the stage by Keith Reddin and directed by Darko Tresnjak. Belcher is quickly building an impressive resume of stage, film and television credits, including Twelfth Night at Hartford Stage; Romeo & Juliet (Classic Stage Company); John Sayles’ independent feature film Go for Sisters, and the HBO mini-series Show Me a Hero. Belcher is currently filming the second season of Mercy Street, where he portrays Samuel Diggs, a black laborer harboring a secret knowledge and ability in medicine. Belcher’s first foray into acting was as a freshman at Belmont University in Nashville. The actor, who hails from Georgia, recalls seeing a number of plays and musicals on elementary school or middle school field trips but mostly just found them amusing. It was Lorraine Hansberry’s A Raisin in the Sun that made a true impact. A college friend of Belcher’s encouraged him to audition for a role in the play. Belcher had no prior acting experience and declined trying out for the lead. He found himself cast in the role of the educated and wealthy George Murchison. Belcher never forgot how thrilling his first experience on stage was. However, he did not pursue acting as an undergraduate, nor did he have any intention of continuing his theatrical excursions. But he remembers how the film Antwone Fisher, starring Denzel Washington and Derek Luke, helped shift his career focus. Belcher’s mom sent him a copy of the film, specifically because the lead character reminded her of him. He watched the film and cried. He watched it again and made a life-changing realization. After graduating from Belmont with a Bachelor’s of Art Degree in Communications and Political Science, Belcher earned an MFA in acting from the University of Southern California’s School of Dramatic Arts, where he was the recipient of the Ava Greenwald Memorial Award. He, along with his cast mates, also received a Helen Hayes Award for Outstanding Ensemble, Resident Play, for The Studio Theatre’s production of Invisible Man in 2012. Rear Window marks Belcher’s return to Hartford Stage. 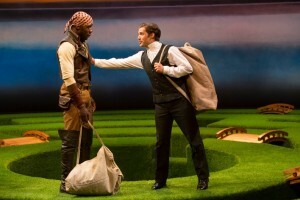 He previously played Antonio in Twelfth Night, also directed by Darko Tresnjak, during the 2012-13 season. Belcher has fond memories of working with Tresnjak. Belcher plays Sam in Keith Reddin’s adaptation of the Cornell Woolrich short story “Rear Window.” Many who are familiar with the classic Alfred Hitchcock film will be surprised to find that the home care nurse portrayed by Thelma Ritter onscreen is nowhere to be found in the play. Rather, it is Sam who spends the most time with the wheelchair-bound Jeffries. Belcher has not yet seen the film and doesn’t intend on watching it until rehearsals are well underway. Originating and inhabiting the role of an unfamiliar character in a world premiere play might seem like a daunting task to many, but Belcher is relishing the challenges that portraying Sam will bring. He notes that the only pressure he feels in bringing the character of Sam to life on stage is that there is no template for him to work from. Generating a new character feels “liberating” to Belcher, and he wants to do justice to the source material. With the recent influx of stage and screen roles coming his way, Belcher has been keeping busy. In addition to shooting the second season of Mercy Street, he’ll soon be playing “Fish” in Lincoln Center’s upcoming off-Broadway production of The Royale, loosely based on the life of boxer Jack Johnson. Belcher will also be shooting a film short called Unorganized. 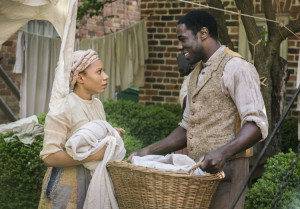 Shalita Grant and McKinley Belcher III in the upcoming PBS series Mercy Street. Even with his increasing presence in the film and television genres, Belcher says his first love will always be the stage. Although he enjoys the opportunity for intimacy that being in front of a camera brings, he admits that he loves the immediacy of theatre and that the energy on a stage – sharing an experience with a live audience – is both palpable and thrilling.